As they’ve done the last couple years, Microsoft opened up the week proper on Monday with their press conference at E3. They’ve done a really good job of rebounding after the tepid response to the initial Xbox One launch and marketing, mainly by focusing a lot more on games during these big showcases. This year though, they took a bit of a chance by also talking hardware – which has worked against them in the past. I think ultimately it was a really solid show though – the new games they showed off hit all the major points, big exclusives, some good third party support, and a variety of genres and tones to play. Let’s talk a couple high points. Before we get to the games, let’s get the more “boring” stuff out of the way. The hardware talk this year was a good mix of platform upgrades for Xbox Live and cross-network play, as well as actual hardware like the new custom controller shop and upgraded consoles. It’s easy to look at some of these announcements and not necessarily be excited, perhaps because of all the flash around the games this week; but I really think that some of what Microsoft is working on is a legitimate game changer. The new Play Anywhere idea in particular is a really cool idea – buy a game once on Xbox One, and you can play it on Windows 10 PC at no extra cause. Progress and achievements all carry over thanks to the Microsoft Cloud. With all of the big exclusives that Microsoft talked about Monday all being part of the program, I definitely see Play Anywhere the first step in gaming trying to really break down those platform/console walls. The Xbox Live upgrades are all welcome ones – I like the addition of clubs, it lets existing communities begin to group up and play together easier; I wonder how much of that is in response to PlayStation doing the same thing a couple months back. The addition of LFG right into the basic Xbox Live service is another really cool idea – no more random matching, you want a group to play the raid in Destiny, you put it up and go. The last addition – Arena – is a little trickier to me. I like seeing competitive gaming becoming easier to get into, and the more options there are to play in tournaments, even as an amateur is a really cool idea. I just wonder how smooth the implementation will go. The most exciting hardware news though is the Xbox One S and Project Scorpio, the two new versions of the Xbox One that Microsoft is releasing. Xbox One S should be a good way to try and get new players moving to the console – HDR gaming, 4K video and up to a 2TB internal hard drive is a great combo. Add in it’s a smaller footprint, and it’s a solid all around console. I don’t think that current Xbox One owners need to upgrade – not yet. But it’s a good way to get new people on board. Project Scorpio on the other hand does look like it could be a good upgrade point. All we really know is some specs for it – 6 terraflops of computing power, true 4K display and support for VR tech all sound like a pretty sizable upgrade. Pricing will be a big question – especially since you’ll pretty much need a 4K TV to really see the difference. But it’s still a year out – TV prices can change a lot in that time – and everything will be compatible, across Xbox One, Xbox One S and Scorpio. It really feels like Microsoft is trying to go from being one console, to a full console family. It’s a risky move for sure, especially knowing that PlayStation also has an upgraded PS4 coming. All of that is great, but what we really watch E3 for is the games. Microsoft has certainly lost a bit of third party support in the last couple years – Destiny and Call of Duty both are PlayStation first titles. But Microsoft has been, to me at least, showing a really good focus on trying out new IPs from their exclusive developers. We saw four games that are part of franchises – Gears of War 4, Forza Horizon 3, State of Decay 2 and Halo Wars 2. Every other exclusive was a new IP – including some games that I could easily see being heavy hitters. Of those sequels, I think Forza is the one that I’m most interested in – I never really got deep into Gears, I never played State of Decay and I’m not a big fan of RTS games. Forza Horizon 3 though looks gorgeous, as Forza games always do, and having four player, cross platform co-op play is really cool. I like the setting of Australia – it’s different from just about any Forza yet. The new car classes also look to help break up the gameplay. For me, the most exciting games I saw, exclusive-wise, were new ones. First, we saw We Happy Few, from the team behind BioShock. It looks dark, it looks heady, it looks frightening, but overall it looks incredible. It’s going to be in the Game Preview program starting July 26, so the wait isn’t long. The other game that really got me pumped up was Sea of Thieves – I was interested last year when Rare announced it, but seeing it in action solidified it. Persistent online world, with a huge emphasis on co-op group play, and you get to be a whole pirate crew? Count me in. I love how colorful it looks too – a lot of big name games are always so washed out and trying to be dramatic. Sea of Thieves though uses the bright color palette to make the whole world feel a lot more alive. Microsoft also has the ID@Xbox program, which is where We Happy Few comes from, as well as Inside, the new game from the creators of Limbo, which looks incredible as well. And of course Cuphead is on the way from that same program as well. Third party games also got shown during the conference, and it was a pretty good mix I thought. Final Fantasy XV got a demo of a massive fight against Titan – that honestly was underwhelming. I think it was just because the actual fighting shown was sloppy, but I came away unimpressed. Battlefield 1 showed the same gameplay trailer as the day before, as well as announcing that EA Access members on Xbox One can play the game a week early on October 13. While Minecraft isn’t technically a third party game, I still think of it as one – and I really like the move they’re going with. They’re adding in cross-network play, right now focused on the mobile versions with PC, but console support is coming. That’s the one real feature that I think Minecraft really is tailor-made for. Tekken 7 was shown, with Akuma appearing, and it looked solid. Nothing crazy for a Tekken game. Scalebound, the new game from Platinum games got a co-op gameplay demo, and it continues to be a game that confuses me. The idea behind it is awesome – hack and slash Platinum goodness, with a giant dragon as back-up. But the tone of the game just keep catching me off guard – it’s got a lot of levity and almost some degree of self-awareness about it. I wonder how much of that is the Japanese influence in the development, but it’s not something that I think would keep me from buying it. I think the big surprise came from Capcom though, with a really slick trailer for Dead Rising 4. It looks a lot like a return to what got the franchise started – Frank West, and a mall full of zombies. I know that a lot of media has been down on the Microsoft show – especially after the Sony show, which I missed. And maybe it’s because I’m primarily an Xbox guy first these days, but I don’t know how you come away from that show and not go, “Microsoft has some really cool stuff coming in the next year or so.” Maybe it’s because they took time to show hardware, which is always kind of boring to hear at big events. Maybe it’s because PlayStation 4 has just been doing everything right over the last few years, while Xbox One has had a couple hiccups along the way. Whatever the reason, I think it’s another bit of that kind of negativity and pessimism that surrounds gaming in general lately. Was Microsoft’s show flawless? Not at all. But I came away from it excited to be an Xbox One owner, and ready to see what the next year brings. As of the writing of this, I still have a little work to do on the Mega Man 2 Title Screen for my Mega Man Land project. All that’s left is the actual logo of Mega Man, which as I said a couple weeks ago during my Mega Man 3 work, has proven to be a pain. So I’ve been taking the whole screen a little slowly – tackling it one section at a time to make sure I didn’t miscount. Unfortunately that plan didn’t quite work out for me. I’ve already made one counting mistake, luckily one that wasn’t a tough fix. As for those details that I mentioned in last week’s post, the building and Mega Man himself; those were actually really quite simple to do. The building’s toughest part was not losing count on the vertical edge. Once I had that set, the sections are all divided up enough where the count wasn’t enough to really be an issue. The windows, which have some extra detailing in them, also went really smooth. The biggest problem I have with doing the Title Screens so far though is just the sheer amount of black wool I need to place. And it’s really not even a problem, it’s more that it’s just such a slow process that it makes me less interested in doing the screen for long periods at a time. The Stage Select screens are a different beast because there’s so much going on – even though there’s a lot of blue wool in each screen, it’s broken up with all kinds of extra stuff. And the Sprite Field is totally different as well, in fact, the sprites have become my favorite part of the project. They’re quick to do, they look super cool when their all finished, and I think they add a little bit of extra flair to the project. So going into this week the plan is to finish up the Title Screen and get going on the sprite field. Depending on how fast the Robot Masters go there’s a good chance that I’ll finish it all this week. The question with this one is what to put in the extra space – there’s no Doc Robot or Protoman to fill the blank space. My early ideas are the three Item power-ups as well as Doctor Wily in some form. Then it’ll be on to the game I’ve been dreading – the original Mega Man. I’ll explain why when we get to it. It’s a funny thing – when I started this project, it was originally just going to be Pharoah Man; he’s my favorite Robot Master after all. When it ended up being easy enough to do though and I decided to create the whole “love letter to Mega Man” project, I was in a bit of a weird situation. I had started not at the beginning, but right in the middle of the series. Since then I’ve gone backward in the franchise, which has given me a pretty unique view of the design process with the Stage Select and Title Screens. 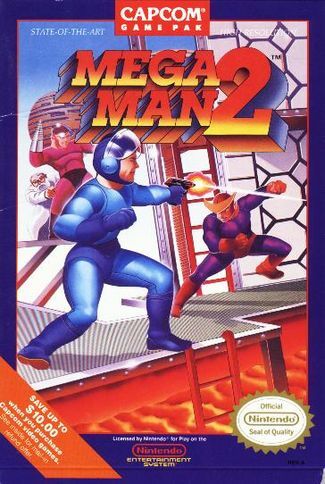 That perspective is super apparent now that I’m working on Mega Man 2. Let’s start with the Stage Select screen, since it’s the part I just wrapped up with. Mega Man 3, as I mentioned in my updates while I was working on that screen, has a ton of detail in there. The portrait frames are pretty complicated – the lights on the corners are actually bulged out, so it’s not a perfect square. That makes it a little more complicated to go through them. In Mega Man 2 the portraits are just simple squares – 45×45 pixels. The lights for the corners are simple squares too. The design is much more simple too – just full bars of colors – compared with Mega Man 3, which had a lot more detail in the bars. The field aside from the portraits is also much more simpler – just a few bars of color in Mega Man 2, compared with the “Mega Man III” that repeats all throughout the field. So after spending a couple weeks working on Mega Man 3, I have been very happy to see the simpler design. The Robot Masters have actually been pretty simple too – the color scheme is much less involved – with each bot really only using a couple colors. The problem comes from Bubble Man – his green colors don’t quite match up. I’m alright with the final result, but it’s definitely not perfect. The only really other issue was with Quick Man – his boomerang actually breaks through the portrait, so it took a little double checking to get it down. 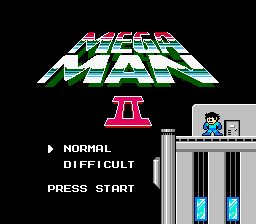 As for the Title Screen – unlike Mega Man 3, which I think is pretty much the peak of the early games complexity in Stage Select; Mega Man 2 is the peak in the early games complexity on Title Screens. With the building, Mega Man himself, plus the whole logo, there’s a lot going on. They went the total opposite on Mega Man 3 – it’s a full black screen after all. After that they decided to add in just a few little bits of details to give it a bit more energy. I’m actually pretty excited to see how it ends up with the color palette that Minecraft has. When I started this whole project, I knew that this was going to be a huge undertaking. Six NES games to do, plus two more 8-bit styled ones in Mega Man 9 and 10 – not to mention the possibility of doing the fan-made 8-bit de-makes of Mega Man 7 and 8. That’s a whole hell of a lot of Minecrafting to do. 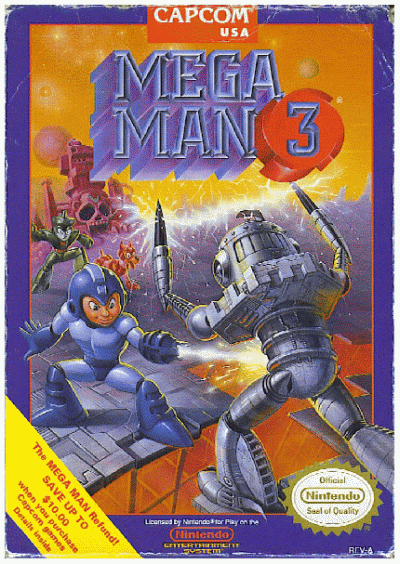 What I didn’t expect was that Mega Man 3 – the second game I tackled – would be so damn frustrating. I already have mentioned my continual messing up while doing the Title Screen, and also found another small error I had made in the Stage Select. Thankfully, it was only two blocks that needed to be fixed, so it didn’t mess up much. I only even found it because I was going overly detailed with one of the new additions to the sprite field. I decided to put in Break Man (Proto Man)’s portrait in, which was actually pretty cool, thanks to his scarf breaking out of the border. I did something similar with Dr. Cossack in Mega Man 4, but since Break Man is actually named like the other Robot Masters, I put his name below the portrait too. Of course that meant applying the background too – I made sure that the placement of the “Mega Man III” matches up with the center portrait on the screen. That’s where I found my error – I had messed up on the “M” in Man on a couple in the screen. Once that was dealt with though, I had a bunch of blank space to fill in with the sprite field. After digging around for a good sheet of Rush, I was able to put in Rush with Coil and Jet in there, along with all of the weapon energy and health energy pick ups. I got a little lucky there, in that there was just enough space for each pick up. While I was in pick up mode, I finished up the buffer zone between games, carpeted the whole thing, and called Mega Man 3 completed. 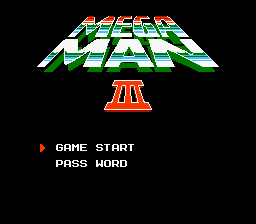 I was still feeling the Minecraft though, so I went ahead and moved on to Mega Man 2. I set up four stacks of 64 blue wool, switched to survival, and set up the bottom row of 256 for the Stage Select. The thing with Mega Man 2 is that the Stage Select is a lot more sparse than Mega Man 3 – there’s not much going on, so to get started there was some counting of pixel rows. Moving back a game also adds in another little detail – for each Robot Masters’ name, in the later games, the white pixels are bordered with a row of black to add some depth. That row of black doesn’t exist in Mega Man 2, so the letters look a little weird right now. Since I was on a roll, I went ahead and finished up Metal Man and Flash Man – both were pretty easy to do, although Metal Man isn’t quite an exact match. The early Mega Man games use what is basically a really dark magenta color for deep red – which doesn’t exist in Minecraft, so I just used red wool and pink clay, like I have for the rest of the red Robot Masters. All in all, the Stage Select should go pretty smooth, it’s the Title Screen I’m looking at – there’s a lot more going on with it than any other one. I shared last week how I went about tackling the Robot Master sprites for Mega Man 3. Much like with those sprites, I took a little different approach to the Mega Man sprites with the weapons. With Mega Man 4, they were all bundled up together into one set – which looks alright with the fences I use for dividing and orientation removed. With this set though, I wanted to take a little more organized approach, hence my breaking the Mega Man sprites out into a separate section. In order to keep everything on one level, my plan was to put a standing sprite of Mega Man (with one exception), and the weapon’s sprite below him, followed by the menu icon. Aside from Top Spin, the plan worked pretty well – there’s a little variation, thanks to the fact that some weapons have big sprites – Spark Shock and Shadow Blade – while others are really quite thin – Gemini Laser and Needle Cannon. Instead, that looks a lot like a pinkish-grey color. And while there is is a pink wool, and even pink clay, both have too much red in them to really act as an analog. So I ended up using the pink clay, but I’m not super happy with out it turned out. If there’s an update down the road that offers a better option, this is definitely one detail that I’ll go back and change. The other issue was also with Top Spin. It doesn’t actually have a weapon sprite – when you fire it in mid-air, you spin around a whole bunch – that’s the attack. 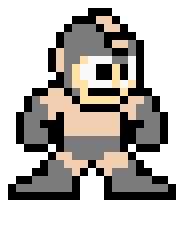 So I used the jumping sprite for Mega Man, but instead of also using the crappy pink color for the spin lines, I just decided to forgo them completely. So Top Spin is a little off compared with the rest of the Mega Men. Once I had finished up the Mega Man work, I decided to look at the buffer zone between Mega Man 4 and Mega Man 3. I had originally planned on putting in various sprites of Mega Man, Proto Man, Rush and even Robot Masters that I liked. What I instead went with was a repeating pattern of the 1-Up power-up (Mega Man’s Head) and the E-Tank pick-up. I had left a bit too much space horizontally, so when I go ahead on to Mega Man 2, I know to leave a bit less, to give me a nice even split. I think 20 blocks will let me have two free spaces on either side of the widest parts of the sprites. But the nice thing is that with the white carpet placed down after, it looks pretty good. It’s certainly better than just having blank space – it gives a bit of a feeling like wallpaper to me. Which brings me to my plan of attack for this week. I still have a bunch of free space in the sprite field, so much like I did with Mega Man 4, I’m going to add in an extra portrait. Instead of making the one for Wily, which would go with theme, I think I’ll do Break Man (Proto Man) and if there’s still space enough, I will do one of the busted ones from the Doc Robot phase. After that’s handled, I need to extend down the buffer pieces down to the sprites, carpet it, and then it’s on to Mega Man 2. I would say I’m probably only a couple hours away from moving on, which I can’t wait. Mega Man 3 definitely has been a much more complicated project than Mega Man 4 was. I don’t expect Mega Man 2 to be that rough, but I will be making sure to not add in more user error like I did this time around. After a week of no progress thanks to a lovely January Flu, I finally got back to work on Mega Man Land this past week. I spent a pretty good amount of time on Thursday and Friday working on the sprite field for Mega Man 3. I mentioned in my post on the Title Screen that I kept screwing up which made that whole part of the project a pain. 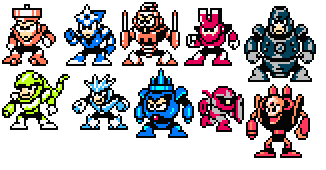 While I didn’t really have any such screw ups, I did have to make a pretty big change part way through the Robot Master sprites. With the sprites for Mega Man 4, I went in planning on going about them in the order I fight them – as well as including Mega Man with that Robot Master’s weapon and relevant sprites. While this is certainly a complete way of doing it, the resulting sprite field is rather messy – even after cleaning it up by removing the fences. I wanted to take a much more organized approach to Mega Man 3. With that in mind I started at the left edge of the screen, as before. Again, using the same order that I would tackle the bosses in, I went about it. 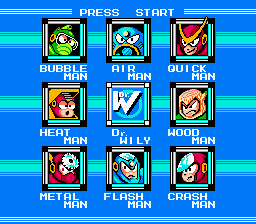 My goal was to try to keep all the Robot Masters on one row – straight across the bottom of the Stage Select screen. I lined them up with bottom of my buffer between screens, so their feet weren’t quite lined up – Spark Man and Hard Man both extended a bit below, but that wasn’t really that much of an issue. Where I ran into my problem was all the way at the last Robot Master – Needle Man. I had seven already taken care of, and Needle Man was supposed to fit into the last bit of space. When I took a look at his sprite though, it was clear that he wouldn’t fit – he is one wide SOB. So instead of having him extend over into the barrier, or be the only Robot Master on a second row, I took advantage of a Mega Man 3 quirk. Mega Man 3 is the only classic series game that has two loops of weaknesses. Normally, the games’ Robot Masters form one big cycle – you just have to pick the one you can beat with just the Buster, and then start the loop. In Mega Man 3 though, that’s a little different. 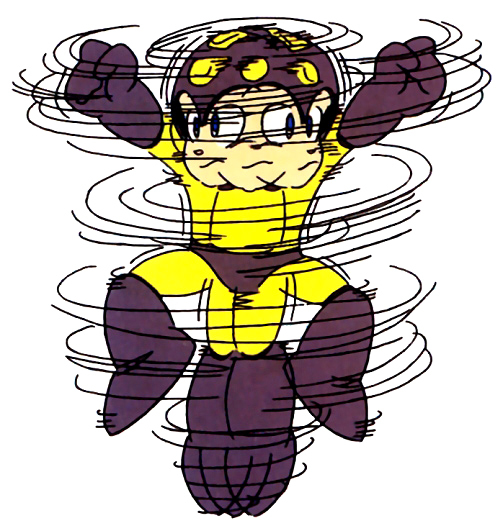 Five Robot Masters have one loop – Top Man, Shadow Man, Spark Man, Magnet Man, and Hard Man – while the remaining three have a second one. 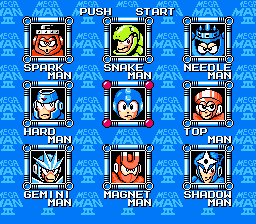 That meant I could drop down Snake Man, Gemini Man and Needle Man into a second row and it still would make sense. It did mean undoing my work on Snake Man and Gemini Man’s sprites that I had already made, but that was a little detail. In the end I think it’s the better course. It also opened up enough space to put in Break Man (Proto Man in disguise) as well as a Doc Robot sprite in there, along with a huge Mega Man health bar for flair.